The actions of Julian Assange of WikiLeaks and Edward Snowden, the NSA intelligence leaker, seem to have instigated the Age of the Whistleblower, but the latest example of this phenomenon may prove highly beneficial for endangered species and the environment. 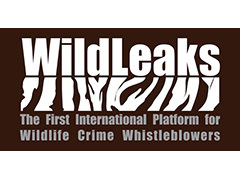 WildLeaks is a new platform and website that allows people with inside information about wildlife and forest crimes to report any and all information “while remaining anonymous and without going directly to law enforcement.” The founders of WildLeaks encourage informants to report names of wildlife traffickers, financial documents related to wildlife crimes, information about shipping companies, and much more. Andrea Crosta, the head of the Elephant Action League, recently told National Geographic that WildLeaks was inspired by a recent investigation into the ivory trade. The experience convinced him that creating an independent, non-governmental entity was important because many individual insiders tied to trafficking have no method or avenue for reporting the information within their own territories. According to Crosta, the complex system set up by WildLeaks encrypts information with full security, and he considers the process far more anonymous and secure than using hotlines set up by government entities. Anyone with inside knowledge of wildlife crimes should visit wildleaks.org. Posted on March 14th under Global Ecology.